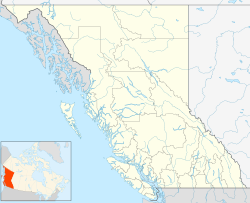 Arrowhead is a former steamboat port and town at the head of Upper Arrow Lake in British Columbia, Canada. Though the initial site has been submerged beneath the waters of the lake, which is now part of the reservoir formed by Hugh Keenleyside Dam at Castlegar, the name continues in use as a reference for the locality, and is sometimes used to refer to the local region. Although the most obvious origin of the name is that Arrowhead is at the head of the Arrow Lakes, another version claims that it relates to the finding of arrowheads in the ground during construction of buildings in the area, left from an ancient battle between First Nations peoples. Another version says that it is because of the arrowhead-shaped appearance of the lake from high ground in the vicinity. The name of the Arrow Lakes is credit to "Arrow Rock", a large cliffside pictograph shot through with clusters of arrows, again relating to an ancient battle (in this case known to be between the Sinixt and the Ktunaxa), which stood above "the Narrows", a stretch of fast-flowing channel connecting Upper Arrow to Lower Arrow Lake. ^ "Arrowhead (locality)". BC Geographical Names. This page was last edited on 14 August 2017, at 17:38 (UTC).